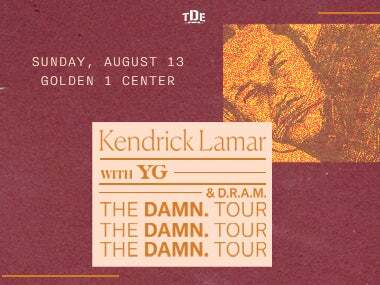 SACRAMENTO, CA – Top Dawg Entertainment (TDE) and Kendrick Lamar announced today that the sold out THE DAMN. TOUR is expanding to even more cities across North America. Continuing throughout August and early September, the tour produced by Live Nation will have YG and D.R.A.M. opening for Kendrick starting August 11 in Anaheim, CA heading to Golden 1 Center in Sacramento on Sunday August 13. American Express® Card Members can purchase tickets beginning Thursday, May 18 at 10 a.m. local time through Friday, May 19 at 10 p.m. Tickets go on sale to the general public Saturday, May 20 at 10 a.m. For more presale details and ticket information, please visit http://www.ticketmaster.com. Live Nation Entertainment (NYSE: LYV) is the world's leading live entertainment company comprised of global market leaders: Ticketmaster, Live Nation Concerts, Live Nation Advertising & Sponsorship and Artist Nation Management. For additional information, visit http://www.livenationentertainment.com. Aug 13	\ The DAMN. Tour – with YG and D.R.A.M.